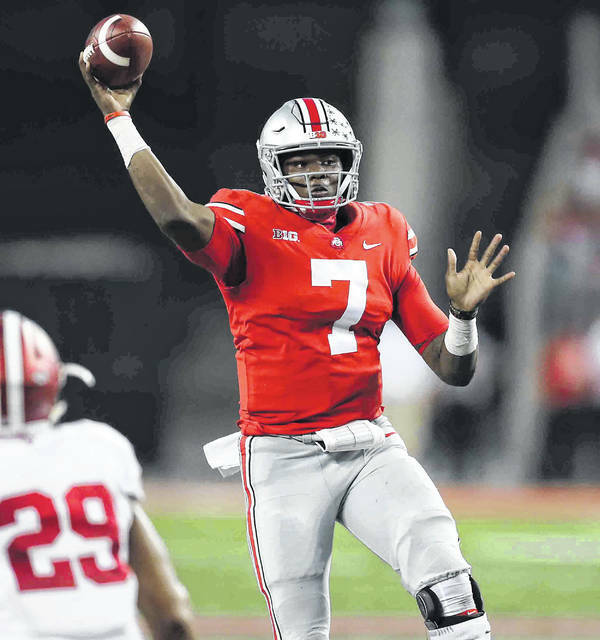 COLUMBUS — Ohio State coach Urban Meyer was careful and chose his words cautiously after Ohio State’s 49-26 win over Indiana on Saturday when asked if the latest spectacular game by quarterback Dwayne Haskins should put him into the Heisman Trophy conversation. OSU’s sophomore quarterback completed 33 of 44 passes for 455 yards and six touchdowns when the No. 3 Buckeyes stayed undefeated at 6-0 overall and 3-0 in the Big Ten. His 455 yards in the air was three yards short of Art Schlichter’s school record of 458 yards and the six touchdown passes tied a record held by J.T. Barrett and Kenny Guiton. “I never want to hold our players back. I don’t know what else is out there. I’m worried about Minnesota and I’m worried about our defense and our run game and I’m worried about guys getting healthy. I’m not going to hold him back but our focus is on Minnesota,” Meyer said. 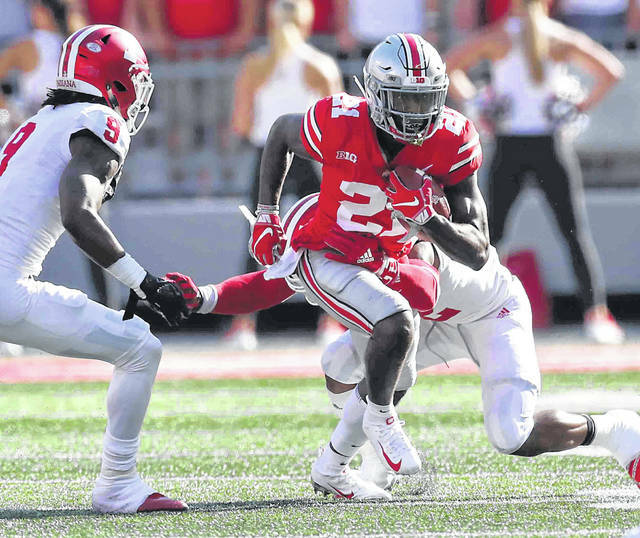 OSU wide receiver Parris Campbell wasn’t holding back, though, when he talked about what Haskins did on Saturday and what he has done in his first six college starts this season. “I think you’re witnessing a legend in the making,” said Campbell, who caught nine passes for 172 yards and two touchdowns on Saturday. “The things he can do throwing the ball, the leader he’s becoming and obviously the stats speak for themselves. Dwayne’s a unique talent. His play heightens everybody else’s play because of the things he can do,” he said. 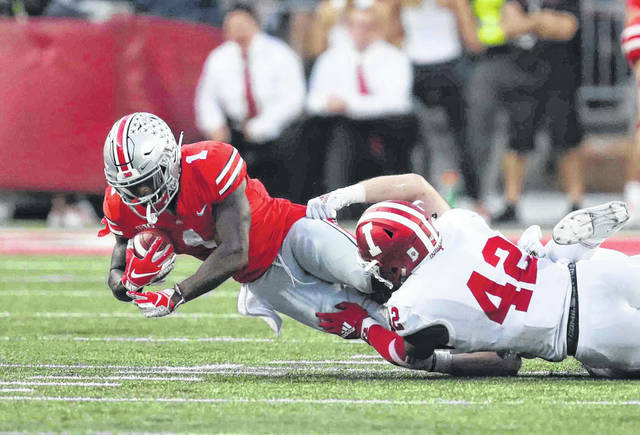 Terry McLaurin also caught two touchdown passes and Johnnie Dixon and Binjimen Victor each had one on a day when OSU’s rushing game was limited to 154 yards. 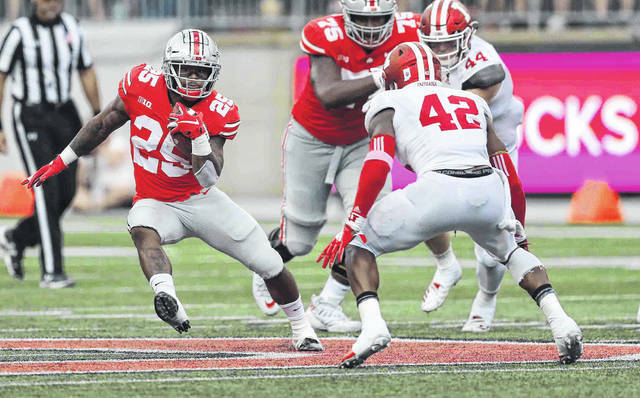 J.K. Dobbins led Ohio State’s rushing stats with 82 yards on 26 carries and Mike Weber gained 70 yards on 13 carries. Ohio State struggled to put Indiana away until the second half. The Hoosiers (4-2, 1-2 Big Ten) led 17-14 late in the second quarter before OSU scored two touchdown in a span of two minutes, 23 seconds to go up 28-17. Indiana never got closer than eight points the rest of the way and Ohio State dominated the final two quarters. At the end of a first half where the two teams combined for 668 yards of total offense it appeared whoever had the ball last in the game might be the winner. Ohio State had 351 yards total offense in the first half and Indiana had 317 yards. 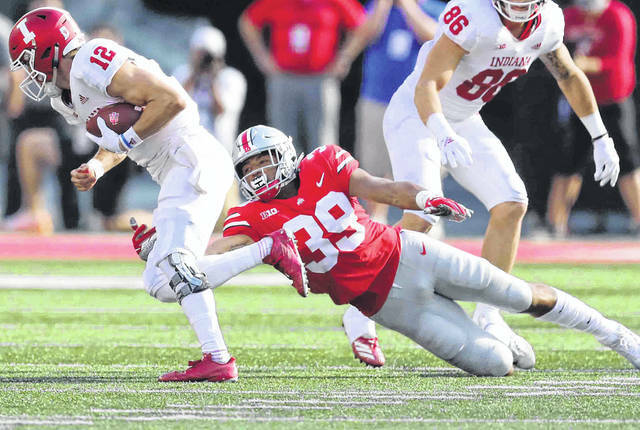 But in the second half, OSU added 255 yards to its total and Indiana netted only 89 yards. Indiana took a 3-0 lead on a 37-yard field goal by Logan Justus after taking the opening kickoff. 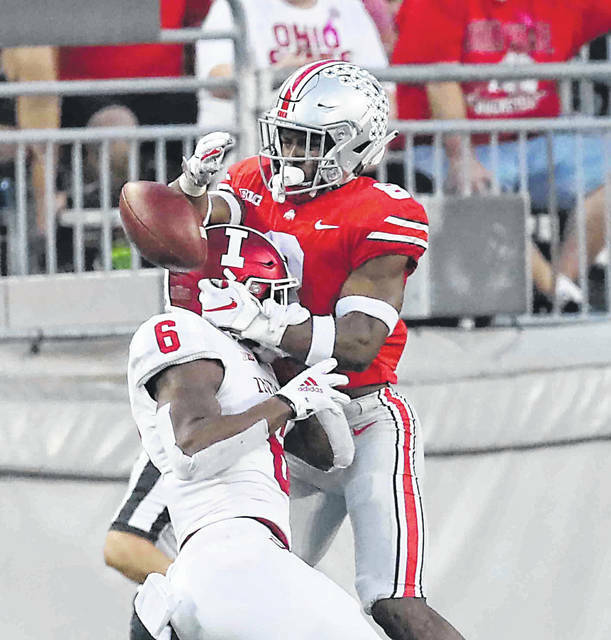 Two big plays on the Hoosiers’ first three snaps – a 16-yard pass to J-Shun Harris and a 45-yard run by Stevie Harris got them to OSU’s 14-yard line. But Ohio State’s defense limited the damage to a field goal. The Buckeyes called all three of their allotted timeouts in the first 8 minutes, 52 seconds of the the first half. OSU went up 7-3 when Dobbins’ 1-yard touchdown run ended a 9-play, 71-yard drive with 2:58 left in the first quarter. 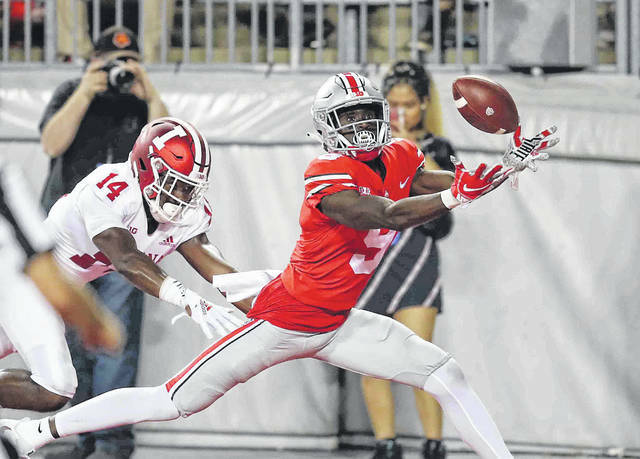 Haskins’ 39-yard touchdown pass to Johnnie Dixon 2 ½ minutes into the second quarter put Ohio State up 14-3 but it took Indiana only five plays to cut the score to 14-10 on a 32-yard touchdown pass from Ramsey to Peyton Hendershot. Ramsey’s 19-yard touchdown pass to Nick Westbrook with 7:04 left in the first half put Indiana up 17-14 before the two teams combined for two touchdowns and a field goal in the final 4:39 of the half. OSU went up 21-17 on an 18-yard touchdown pass from Haskins to Campbell with 4:38 left in the first half. After Tuf Borland recovered an Indiana fumble at IU’s 32-yard line, Ohio State took advantage of the mistake with a 7-yard Haskins to Terry McLaurin scoring pass for a 28-17 lead. Indiana cut the lead to eight points, 28-20, at halftime on a 37-yard field goal by Justus with 40 seconds left in the first half. A 71-yard touchdown pass from Haskins to Campbell a minute into the second half gave OSU a 35-20 lead and broke the game open. Ohio State’s Paris Campbell Jr. heads up field after making a catch against Indiana’s Jonathan Crawford (9) and Marcelino Ball (right) during Saturday’s game at Ohio Stadium in Columbus. Ohio State’s Mike Weber looks to avoid Indiana’s Marcelino Ball during Saturday’s game at Ohio Stadium in Columbus. Ohio State’s Binjimen Victor makes a catch against Indiana’s Andre Brown Jr. during Saturday’s game at Ohio Stadium in Columbus. Ohio State’s Johnie Dixon lll stretches for extra yards against Indiana’s Marcelino Ball during Saturday’s game at Ohio Stadium in Columbus. Ohio State’s Kendall Sheffield breaks up a pass intended for Indiana’s Donavan Hale (6) during Saturday’s game at Ohio Stadium in Columbus. Ohio State’s Dwayne Haskins jumps up to make a pass during Saturday’s game against Indiana at Ohio Stadium in Columbus. Ohio State’s Malik Harrison reaches out to try and make the stop against Indiana’s Peyton Ramsey during Saturday’s game at Ohio Stadium in Columbus.